What a week: shootings in Minnesota, Louisiana and Texas, all on the heels of Orlando. At times it appears our world is coming apart at the seams. We struggle with race relations. As white Americans, most of us don’t understand the trauma some of our fellow citizens face. And now we have five dead and a seven wounded police officers in Dallas. What are we to think about this? How are we to respond as Christians, as followers of the Prince of Peace? This week we’re looking at the end of Paul’s first missionary journey. We left Paul and Barnabas two weeks ago in the town of Lystra, where the priest of Zeus through they were gods and wanted to offer a sacrifice to them. The two quickly tried to get this thinking out of the people’s heads, which is where I ended the sermon. But as had happened in earlier cities, after having been received positively, opposition rises and soon they’re stoning Paul. The events unfold quickly. At the end of our morning reading, Paul and Barnabas are back where they’d set out from two years earlier. 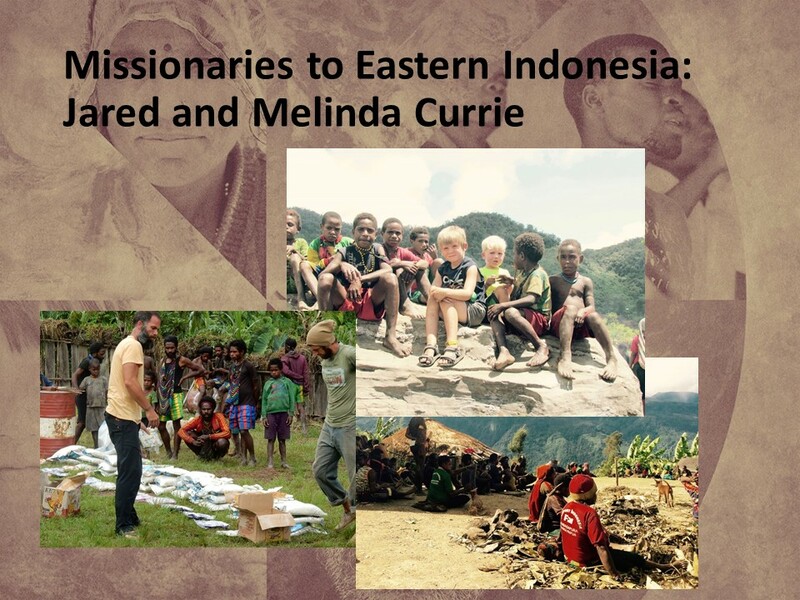 Although their missionary efforts are successful, it also takes its toll. Few things worthwhile are ever easy. It always been that way because we live in a fallen world, but we (like Paul and Barnabas) are working to further God’s kingdom as we long for the redemption of the world. Read Acts 14:19-28. I’ve always enjoyed hearing missionaries talk. As a child, we were blessed to have an interim pastor who had grown up as a child of missionaries in China. He himself became a missionary and served in China for ten years or so, until 1949, when the Communist expelled all missionaries. Even though I was only eleven years old, and his work in China was several decades earlier, I listened in awe at some of his stories from a bygone era. A few years later (at this point I was in high school), we had a missionary from the Congo. This was when Mr. Jennings was our minister. He was one of the most pastoral pastors I’ve known, and was by far the most prompt. I was amazed at how Mr. Jennings always got us out at noon. You could have set your watch by his benediction. Church started at 11 AM and when the big and little hands of clock at the back of the church pointed straight up, he was raising his hands to bless us. Of course, this meant sometimes he seemed to say the same thing over and over again in the sermon (to make up time). On other occasions, it seemed as if he cut out chunks of the sermon. But he always ended right at 12 o’clock. Then came this guy from the Congo, who lived without in a world without watches and held services in open air churches out in the bush. On this Sunday, the missionary to the Congo was on a roll. He told stories about his life and work which he wove into his sermon. I was on the edge of my seat for the longest time, with visions of Ernest Hemingway and Robert Raurk. Then I looked at my watch and realized it was 12:20. He didn’t appear to be anywhere close to wrapping things up. I started to hear stomachs of fellows parishioners rumble. A few people got up and left. My mother commented that afternoon about how problematic this could have been for those who had roasts cooking in their ovens. He finished at 12:40 PM; there was much grumbling at the coffee hour. The next missionary I remember was a young woman working in Brazil. Not to risk going overtime on Sunday morning, they had her talk at an evening potluck. She spoke about her work in education among homeless children in a Brazilian slum. One of the elders of our church, Deacon Jones, had the corner on the mobile home market in Southeastern North Carolina. He listened intently to the plight of the homeless in Brazil and then offer his rather self-serving solution: affordable mobile homes. It was all I could do to avoid bursting out in laughter. I admired the gracefulness of how she handled the situation. 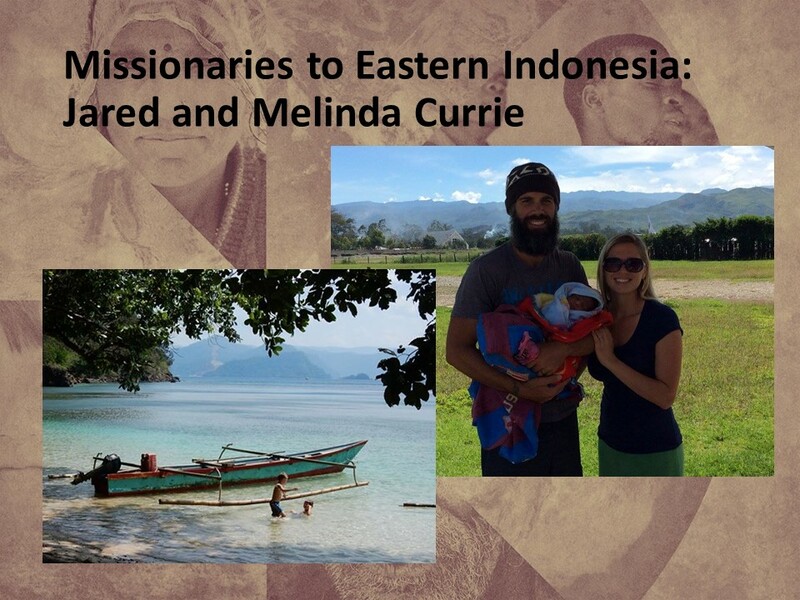 Recently, thanks to Facebook, I’ve been keeping up with Jared and Melinda Currie, who are missionaries on a far eastern island in Indonesia. Jared is the son of the former Baptist pastor in Hastings, Michigan. When I was in Indonesia five years ago, I spent a couple of days with him and his family at the New Tribe’s missionary training center where they were learning languages. Upon graduation, two couples were sent to an island where they are living among native people known as “the Dem.” A lot of Indonesia is Muslim, but on this island which is close to New Guinea the people’s religion is mostly animistic. They still live in what we’d considered very tribal and primitive ways. When they get to where they have internet access, the Curries update their Facebook page with stories of their adventures. The Curries have enjoyed some incredible feasts on this remote island in Eastern Indonesia—eating wild pigs that have been hunted down with bows and arrows and then roasted in large pits. A couple months ago, at one such gathering, things erupted into a huge fight. An argument had started. Before long, they had separated into two large groups, each shouting insults at the other. Then they began to throw stones. The men pulled out their machetes and swung them around as if preparing to charge while others grabbed their bows and begin to draw back arrows. Jared and another missionary ran between the two groups calling for calm. They finally got everyone to put down their stones and weapons but not before Jared had tripped while dodging stones and hurt his leg. I think Jared could relate, at least more than we can, to what the Paul and Barnabas endured during their missionary journey. “Blessed are the peacemakers,” Jesus says. It’s good for them to be blessed for peacemaking can be dangerous business. Jared experienced this as did those officers in Dallas who were there to keep peace in the rally on Thursday night. “Blessed are the peacemakers for they shall be called children of God.” And we know what happened to God’s son. Living as a Christian, as a child of God, is not always easy. When we left Paul and Barnabas in Lystra two weeks ago, they were being hailed as gods. But things change. In verse 19, we learn that some of the Jews who had opposed the two in Iconium and Antioch, traveled to Lystra and won over the crowds. Paul and Barnabas went from being heroes to villains. Paul was stoned, dragged out of the city, and left for dead. But he wasn’t. Some disciples helped him up. It appears odd that a stoning that left Paul so close to death is just barely mentioned by Luke, the author, who devotes only a sentence to this event. But Luke’s goal is to focus on the gospel. God is working even through Paul’s suffering to spread the good news. After the stoning, Paul and Barnabas take off to southeast, to Derbe. There, we’re told, they preached and made many disciples. Then (get this), they head back the same way they came. Back to Lystra, where Paul had been stoned. Back to Iconium and Antioch, where the crowds rose up against them. Kind of like the police officers in Dallas who woke up on Friday and had to go back to work, Paul and Barnabas go back to where they had been mistreated. The truth of the gospel is too important to be neglected. Sometimes, standing up for the Truth is dangerous. It’s no different today. To use this week’s examples, police must be held accountable for racial attitudes that result in careless shootings just as they must also be willing to protect and serve those who are calling on such accountability. And as followers of the Prince of Peace, we must be emphatic to both groups: the police and people of other racial and ethnic groups who seek justice. It appears that the purpose of Paul’s and Barnabas’ return trip wasn’t so much as to preach as it was to strengthen the believers. They helped form on-going communities with elders to watch over the churches. In verse 22, they remind those who believe that there will be persecution. Doing right doesn’t mean things will go peacefully. God never promised us a rose garden. Jesus made it clear that we may be hated because of his name. The promise isn’t that all will be well, but that God’s presence will abide with us even as we walk through the valley of the shadow of death. Our passage ends with Paul and Barnabas sailing back to the other Antioch (the one in Syria) where they tell everyone at the church there about their experiences. We can image them gathering to listen and being enthralled at their suffering for the gospel. I’m sure a roast or two may have burned that day. Church probably ran late, as the two missionaries told of their stories. The “visual” for the day was Paul showing bruises from the stones. People got to laugh at Barnabas being mistaken for Zeus. But most importantly, they gave thanks to God that the gospel is spreading. Christians belong to the Church. We are a community, not a constituency. Why go local? Because life-changing things don’t just happen in Washington, D.C. The Spirit of the living God is in your local congregation. With that in mind, what can we do to make a difference in our community? 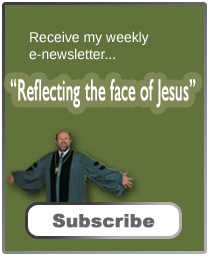 How can we share the face of Jesus to our neighbors? How can we help bring people together? How can we relate to those who are different? How can we model graciousness? Amen. 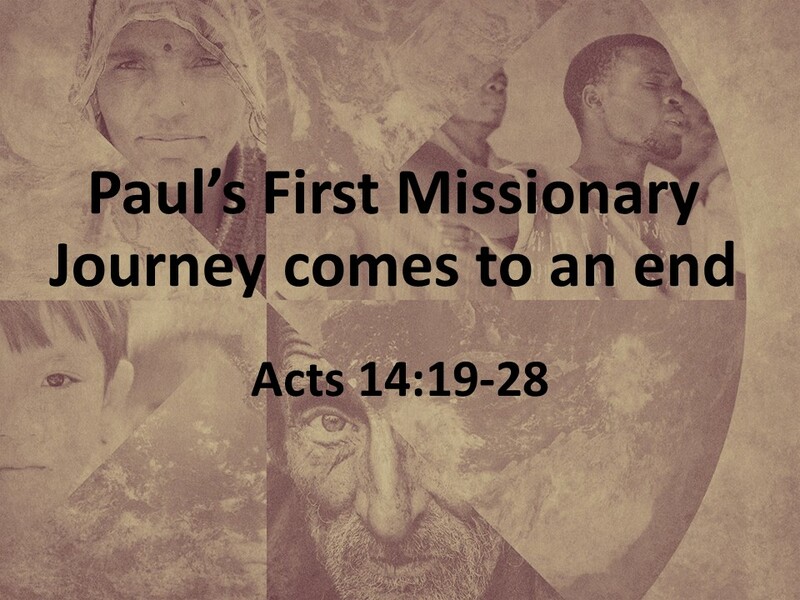 Paul’s first missionary journey is often dated from 47-48 CE or 46-48 CE. William H. Willimon, Acts: Interpretation, A Bible Commentary for Teaching and Preaching (1988, Louisville: John Knox Press, 2010), 127. Good thoughts. Your reference to the burned pot roasts entertaining. The five questions at the end of the sermon are certainly challenging. I don’t have the answers in spite of my very experienced years on this earth. I have been told when asked my age instead of answering with the number of years, just say I’m very experienced.